Do you ever see people with natural long lashes and get jealous? I totally do. There’s just something so romantic, pretty and feminine about long lashes. They make your eyes appear huge. They hide tiredness, camouflage bags and distract from dark circles. If you’ve got long eyelashes you always look made up and put together (but, yet not overdone–long eyelashes look natural at the gym or running errands). So, if you were born with it, flaunt it! 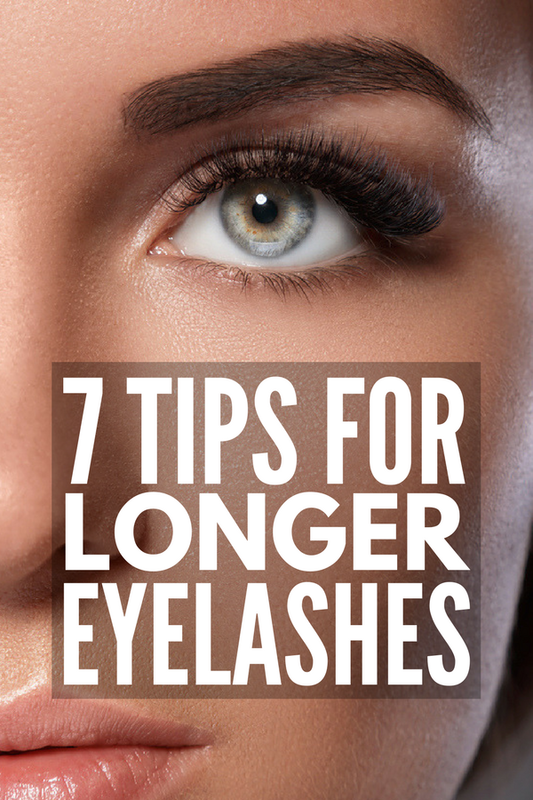 Make the most of your long lashes by using some of these tips to get ULTRA mega long lashes. For the rest of us, here are all the ways to get that long lash look. One long lash trick you’ll notice from the videos later in this post, is that you always have to curl your lashes! I know those lash curlers look like Medieval torture devices, but I promise they’re safe and effective. As you’ll see from video #4, there are even heated eyelash curlers! Curling lashes makes a HUGE difference. For most of us, our lashes grow straight out and getting them to hold a curl helps to open the eye, making you appear more awake, alert and bright eyed. When lashes have a little curve to them, they look longer naturally. A curler is your best eyelash enhancer. 2. Remove Your Eye Makeup! One of the major causes of short, thin lashes is breakage and not taking care of the eyelashes you have. Remember your eyelashes are just tiny hairs that are meant to protect your eye. They can fall out, get pulled out and break off, especially if you aren’t careful. When you sleep in mascara, your lashes stick together and are susceptible to breakage. Rubbing your eyes, pulling and picking at crusty mascara or not using eye makeup remover can result in thin, broken lashes. If you wear glasses, be sure they don’t hit against your eyelashes. If you’ve never tried false eyelashes, give them a chance! They’re easy to apply and there are so many on the market to choose from. False lashes look very realistic and can really blend in to your existing lashes to give you a polished, natural eyelash look. Check out my post on applying false eyelashes if you need help. Of course, false eyelashes can also venture into dramatic territory too! Some quality brands, like Velour have lashes of all different lengths and looks. Pick up a few inexpensive drugstore pairs to experiment with, and when you’re ready to to take the plunge, invest in a nicer set. These lashes can last through wear after wear. If you’re fair-haired and have very pale lashes that are long, but invisible, consider having your lashes tinted. Now, this isn’t an at-home or DIY project. Lash dying should only be done in a salon by a trained professional (because eye + dye = danger!). But, if you’re brave enough to go for it, the results are huge! Eyelash tinting usually lasts around four weeks, but can go longer if you take very good care of your lashes. Eyelashes should be hydrated with moisturizer and of course, makeup should be removed every night to prevent fading. An eyelash tint is usually between $20-$40 and takes about half an hour. There are TONS of lash serums out there. Everything from oils to biotins to different conditioners you can apply to your lashes to help them stay healthy. According to a lash serum review by Shape magazine, most commercial lash serums are bogus. At least, the jury is still out on the effectiveness of these serums and some may even be dangerous. There is one lash growth serum that’s FDA approved and proven effective and that’s Latisse. This is the best lash growth product out there and it really works–it’s the only product that will help you grow longer eyelashes. Unfortunately it’s only available through your dermatologist, but if your eyelashes have fallen out or are very thin, it may be a worthwhile option to explore. There are possible side effects and for the serum to be effective it must be applied faithfully every single day. If you aren’t ready to get thicker eyelashes from a prescription, lash extensions are another salon option to make lashes longer. Lash extensions can be costly, however–running between $80-$300 per treatment, but they last for a month and look absolutely stunning with or without mascara! Best of all? They look like natural long lashes. If you think lash extensions might be the route to longer lashes for you, check out this review in Allure. They require some careful upkeep and you’ll need to go to the salon regularly to maintain them but when you see the dramatic difference you might be intrigued. At the end of the day, choosing the best mascara for length and volume is the easiest path to showstopping lashes. There are mascaras out there that claim to be the best mascara for short lashes, the best mascara for fullness, or the most natural looking. Many curl-enhancing mascaras feature a curled brush (but still take time to curl your lashes first). Others promise to make lashes grow thicker. With so many to choose from it’s hard to find the right one. Well don’t worry! If you’re looking for the best mascara for all types of eyelashes (think: short lashes, thin lashes, straight lashes, and long lashes), want to know which mascaras are best for volume and length, or just need a little help understanding which department store and drugstore brands will give you the best bang for your buck, these tutorials are just what you need! I especially like Michelle’s Phan tutorial because I’m more of a drugstore makeup gal, and I love that she not only gives her honest opinion on the different brands and products available, but also films her tutorial at Walgreens! If you can’t justify the cost of department store mascaras, you will LOVE this review of drugstore mascaras by Michelle Phan. I really trust her opinion when it comes to anything related to makeup and beauty, and I love how honest she is in this tutorial. I also think it’s kind of cool that she’s filming at Walgreens!!! If you want long, dramatic lashes, but don’t want to shell out a ton of money on high end mascaras, this tutorial is for you. Casey uses CoverGirl LashBlast Mascara, L’Oreal Paris Voluminous Extra-Volume Collagen Mascara (I think that’s the one! ), and Covergirl Lashperfection Mascara on her lashes, and I absolutely love the finished look. I have tried each of these mascaras in the past and I’ve loved all of them, and I can’t wait to try them together to see if I can create the same look! If you found these tips, tutorials, and recommended products of the best mascara for short lashes, please share this post on Pinterest! And if you’re looking for more beauty-related tips and tricks, please follow our Beauty board where we share all kinds of great ideas and products we find each day.